If you’re considering a generator for home, business, or recreational use, the cost of that generator is going to be dependent on a number of factors. You’ll first need to determine what size generator you need. The cost of a standby generator that will back up your entire home is obviously going to be higher than a small portable generator like the Honda EU2200i. The type of engine used to power the generator could be gas, diesel, natural gas, or propane and this is also going affect the cost of your generator. Inverter generators cost more than conventional models and silent inverter generators will be even more expensive. There are many brands and the price will vary greatly from one make of generator to another. It’s not just a matter of how much your generator is going to cost, your running costs will have a greater long term impact on your budget. So fuel and maintenance costs for a generator is an important consideration. If you’re using the generator to power your home, shop, or office, there could also be installation costs involved. All this can become a bit complicated if you don’t have the knowledge and you need to approach the whole thing in a logical manner. This article is going to help you get a good idea of what you can expect to pay. We’ll be covering the various types of generators. Give you a basic overview of the wattage that you require, in order to help you decide what size generator you need and what it will cost. I’ll also look into running and installation costs. If you’re not sure how to go about buying a generator and what to expect in terms of costing, this should help you make the best decision. We’ve got to start somewhere, and choosing the right type of generator lets you know what to expect. Finding the correct generator for your needs, at a cost that you can afford, can only be achieved by knowing what to look for. A standby generator is not portable, it is a large unit and requires professional installation. This is going to be the most expensive generator option. Because standby generators need to provide enough watts to supply most or all of your household or business electricity needs, they are large machines with powerful engines. They need to be connected to the existing electrical wiring and this has to be conducted by a qualified electrician who is knowledgeable in the field of generator installation. This is obviously going to cost you. Furthermore, standby generators use more fuel, by virtue of the fact that they have large engines. They also require specialized maintenance which increases your operating cost even further. Standby generators start at about 7.5 KW (7,500 W) and go up in size to accommodate any electrical requirement. A standby generator for the home will seldom be more than 120 KW. That’s a lot of power and can support a large home with a high electricity consumption. A standby generator can run on gasoline, natural gas, propane, or diesel. Your fuel cost will vary depending on where you live. Diesel generators use less fuel than all the others, but will always cost more to buy. Though if you’re using a large generator, the fuel savings, when using diesel, should offset this cost in a big way over the lifetime of the generator. If you have access to natural gas (piped to your home), this can be the cheapest fuel type. You also have the advantage of the fuel being supplied on tap. There’s no need to check and fill the gas tank. Standby generators usually use an automatic transfer switch to connect to your home. An automatic transfer switch starts the generator when the utility power fails. Once the generator is running, the power supply to your home is switched over from the utility to the generator. When the grid power is restored, the automatic transfer switch will reconnect the mains power supply and switch the generator off. This is very convenient, but it does add to the generator cost. Some standby generators will have a built-in transfer switch, other may require that you purchase the switch separately. How much does a standby generator cost? I’m going to be supplying a cost estimate for standby generators. You will need to check the supplier price of the generator that you choose, before buying. I’m basing these generator prices on the Generac MSRP prices for 2019. Prices may change and models will vary, depending on the brand. Generac is one of the middle to top brands. You might find a cheaper standby generator from other brands. Though choices are limited and you should avoid buying a cheap generator from an unknown brand. The cost of installing your standby generator is not easy to estimate without the correct information. The distance from your home to the generator, the wattage, as well as the type of fuel you’re using, will determine the installation cost. The Average standby generator installation cost in the US is around $3,800. Though the cost can be anything from $400 at the low end, up to $10,000 at the high end. 7,500W Standby Generator: ± $2,000 with 8-circuit transfer switch. 11,000W Standby Generator: ± $3,200 with 16-circuit transfer switch. 16,000W Standby Generator: ± $4,000 with 16-circuit transfer switch. 20,000W Standby Generator: ± $4,800 with whole house transfer switch. Natural gas and Propane standby generators cost roughly the same as gas-powered generators. Though the installation cost is likely to be higher. Diesel generators are usually used for a higher wattage output (starting at about 15 KW). I’ve listed the prices for diesel standby generators below. These prices don’t include any type of transfer switch. The MSRP estimated prices for standby generators that I’ve listed above are only for the generator (and transfer switch if mentioned). You will still need to pay for delivery and taxes if applicable. You will also need to pay for installation. You can expect to pay less when installing the smaller generators as they will use lower gauge electrical wiring and will require switches of a lower amperage. The distance that the generator is from your home will have a big effect on the installation costs. There are many options for portable generators and they will always be cheaper than standby generators. Portable generators are used in every situation where one would use electricity. Smaller models are often used for camping, RVs, tailgating, food trucks, and basic home or office needs. Larger portable generators (up to 17,500W) can be used on a jobsite, larger RVs and can even run a home, shop, or jobsite. Generally, I would say that you need to consider a generator upwards of 3 KW for your home. If you’re considering a smaller 3 – 4 KW generator for your home, be prepared to compromise. The most you can expect to run off a generator of this size would be a refrigerator (or room air conditioner), along with your lights, TV, computer, an a few low-amperage appliances. If you’re using a generator lower than 5 KW, you’ll usually need to use extension cords. It’s not really feasible to connect a small generator directly to your house wiring as they simply don’t provide enough power. The generator will trip very easily when your household consumption exceeds the output that the generator is able to supply. You can connect a portable generator to your home using a transfer switch. This not as convenient as a standby generator that uses an automatic transfer switch, but will still make things a lot easier. 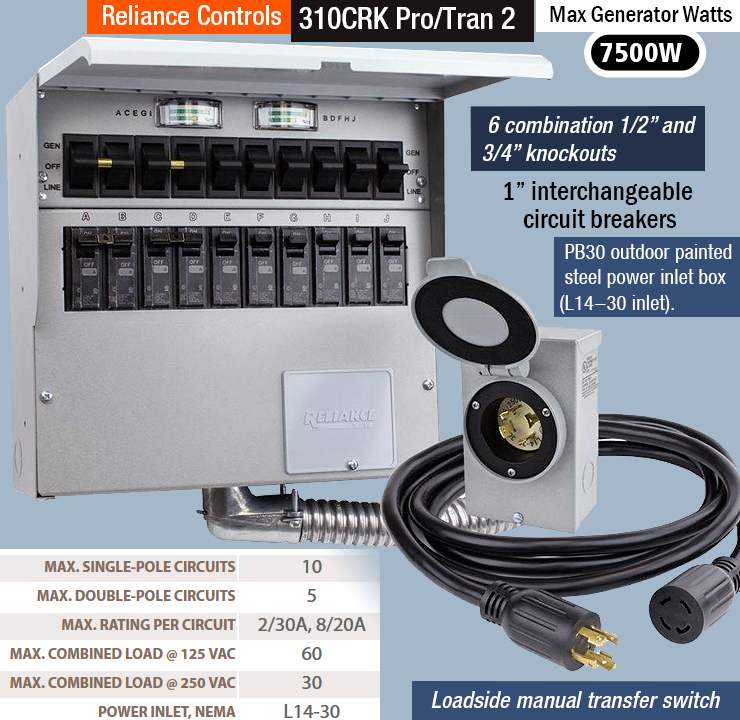 You can buy manual transfer switch kits in a variety of sizes. These will require that you switch the generator on and off yourself. You will also have to manually switch from utility power to generator and back again. But you will have the convenience of using the existing electric outlets in your home and the hard-wired lights. If you’re using extension cords, you’ll only be able to use table lamps that plug into a socket. You should only consider using a transfer switch for generators that deliver 5 KW or more. Even then, you’ll only be able to use a few circuits. You won’t be able to power your entire house using a portable generator. Though the largest portable generators could come to close to providing all the power you need. The benefit of using a portable generator as a backup power supply for your home is that you can also use it for other purposes, like camping. You can buy a basic transfer switch (Reliance Controls TF151W) for under $80. Though it’s more likely that you would want a full kit with auxiliary circuit breakers for the generator supply. For these high-end transfer-switches, you can expect to pay between $250 and $400, depending on how many circuits you require. A larger generator will be capable of handling more circuits and will, therefore, need a larger transfer switch kit. You will also need to factor in the installation cost. The kit may come fully supplied with all the necessary plugs and wiring, but you’ll still need a qualified electrician to install it for you. Because the transfer switch connects directly to the house wiring, this needs to conform to specific regulations. If you’re camping or tailgating, you probably don’t have much space for a large generator. For basic tent camping, you can consider a really small 1Kw to 2 Kw generator. These are usually small and light enough to be carried by one person. They also don’t use much gas and could fit into the trunk of most cars. Though you’ll be very limited to what you can use the generator for. These generators can supply power for a stereo, TV, or similar electronic equipment, along with a few lights and a standing fan or small space heater. If you’re using an RV with air conditioner, you’ll need at least 3,000 watts for a 10,000 BTU AC. You’ll probably want something larger so that can you can run more than just your air conditioner on your generator. If you only need to supply power for a point of sale system and a coffee maker (or similar load), you could get away with a 1 – 2 KW generator for a food truck. Though, in most cases, you’ll probably want to use few more electric appliances. Food Truck owners seem to favor 3 – 4 KW generators. These are small enough to be practical and provide sufficient power for a small (under counter) refrigerator, a few appliances, the necessary electronic equipment, and lighting. The size of food truck generator is entirely dependent on the size of your truck and what you need to power to keep your business running. Jobsite needs vary considerably. One thing to consider when using a generator for power tools, is that they need a high startup wattage (peak load). It will also depend on how many people will be working simultaneously. Several tools, starting at the same time, will require a high peak load. For a few drills or similar tools, you’d be fine with around 3KW. Though most jobsite generators tend to be 5 KW or more. If you’re using high-powered tools, like angle grinders, a higher wattage output will be essential. Even more so, if you’re using a table saw or air compressor. An air compressor can use anything from 3 – 6 KW to start. Along with the size of the generator, you also need to consider what type of generator will be your best option. The cost of the generator will depend a lot on what type of generator you choose. Conventional open frame generators are always the cheapest. These will not use an inverter, nor will they have any type of sound insulation. This will supply your power needs, but is not ideal if you use electronic equipment and the noise can be an issue in a residential neighborhood or campsite. Inverter generators cost more but they supply clean power that will not harm sensitive electronic equipment. In addition to this, they are generally quieter. Most inverter generators are enclosed in a sound-insulated housing. Some (especially smaller models) can barely be heard and can be quieter than the sound of a person speaking normally. Most portable generators use gas as a fuel to run the engine. Some use diesel, though these are rare and are usually generators with a higher wattage output. Propane (liquefied petroleum gas) has become a popular fuel type for its clean burning attributes. Apart from being the number one choice for environmentalists, there are a few other advantages to using a propane generator. You can read more about propane generators in this article: Propane vs Gas Generator. As far as the cost of these generators, gas and propane generators cost roughly the same and those with a diesel engine will be more. There are generators that can run either gas or propane, these are called dual fuel, or hybrid generators. You can even get tri-fuel generators that can run on gas, propane, or natural gas. These generators will cost a little more than generators designed to run exclusively on one type of fuel. Though the price difference is nominal and the advantages of using dual or tri-fuel generators speak for themselves. You have more options and this can be of considerable value during a natural disaster when one fuel type can be more readily available. Once you’ve decided on the size and type of generator you require, it becomes simpler to narrow down your choice according to what you can afford. I’m going to list the portable generator prices under headings according to the type of generator and the fuel type. This will be Open Frame Generators, with sub headings for the fuel types – gas (propane prices will similar), diesel, dual fuel, or tri-fuel. Inverter generators are generally gas-powered, so this will be under one heading. Because there is such a huge variety of generator brands (with varying prices), I’ll supply an estimated low price to an estimated high price. At the lower end of the price range, you can expect to find brands like Champion Power Equipment, DuroMax, WEN, Ford Power Equipment, Westinghouse, and Briggs & Stratton. I may not have listed them all, but I consider these to be affordable, good quality, medium-duty portable generators. The higher end of the price range will more heavy-duty brands, like Honda, Yamaha, DeWalt, and Cat. Both Generac and Westinghouse can fall into both the cheaper and more expensive categories as they produce cheaper, medium duty generators, as well as heavy-duty more industrial grade machines and are priced accordingly. Open Frame gas-powered generators are the cheapest option, regardless of the brand. 7 KW to 10 KW : $800 to $5,200. Most of these generators cost less than $3,000. The Honda EB10000, 10 KW industrial Portable generator is probably the most expensive portable generator on the market. It’s an ultra-heavy duty generator and costs over $5,000. There are not as many dual fuel generators available and these generally begin at 3 KW and upwards. Manufacturers of hybrid generators do not all supply the same wattage range. So you may find that in certain categories, you will only find high-end brands, without many cheaper options. Tri-fuel, or multi-fuel generators are not all that common, so you’ll need to shop around a bit. They are large machines, not available in lower watt output categories. Even though there are a few manufacturers who supply tri-fuel generators (Winco, Sportsman, DeWalt, and some others), availability can be a problem and I haven’t been able to find too many current prices. But I can give you an idea of what you can expect to pay, based on the current (2019) MSRP Winco tri-fuel generator prices. For an 8,000W tri-fuel generator, you’re looking in the region of $2,600. A 12,000W model will set you back around $3,900. Diesel generators manufactured for US electrical standards are rare and quite expensive. The watt range is limited and mostly 5 KW an upwards. It is therefore difficult to give an accurate price list for these generators. You can expect to pay from $3,800 (Generac 5 KW Diesel generator) and upwards. Inverter generators are more expensive and most can be connected in parallel. This means that you can connect more than one inverter generator together, thereby increasing your power output to that of the combined output of all the generators connected in parallel. Parallel kits are sold separately and the prices listed are for a single generator without this kit. There are a greater variety of small inverter generator (under 4KW) and you won’t find much higher than 7 KW in this category. However, the parallel capabilities of most models allow you to increase this. To the best of my knowledge, inverter generators are only available with gas engines. 1 KW to 2 KW : $360 – $1,100. Most of these generators are closed (silent generators) and are priced from $450 upwards. There are a few open frame inverter generators in this price range, like the Generac GP1800 (1.8KW) priced at about $360 (Jan 2019). 3 KW to 4 KW : $600 – $2,300. 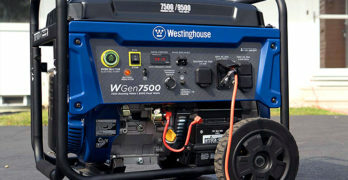 The cheapest generator in this class is the open frame Westinghouse iGen 4200. Enclosed (silent) generators in the 3 – 4 KW range, generally cost over $1,000. 5 KW to 6 KW : $1,150 – $3,700. Choices for high-watt inverter generators are limited to a few brands. 6 KW +: Here, you really have only two choices, the Honda EU7000i being the most expensive (± $4,450), or the much cheaper Briggs & Stratton Q6500 at around $1,200. Solar energy is not commonly associated with the term portable generators. Solar power is a great way to save money on your electricity bill. It becomes even more attractive, if your local authorities offer rebates and tax concessions for renewable energy installations in your home. You can find a grid-tied 1 KW solar charger inverter for below $300. Though a higher wattage, 4 KW, grid tied inverter is probably better and you can use more than one. This will cost around $690. These inverters connect to the main power supply and you either use the electricity generated from the solar panels, or feed the power back into the grid. The power utility will pay you for the excess electricity generated. Good quality monocrystalline solar panels average at about $1 per watt. Whilst not too common, portable solar generators are available. Portable solar generators will not always be the most practical solution. They only generate power when the sun is shining and you have limited power storage, depending on your battery capacity. These generators are not too powerful, mostly under 3000W. They are also quite expensive. Though once you’ve bought the solar generator, you have no fuel costs. They’re totally quiet, apart from a barely audible hum generated by the inverter and they require almost no maintenance. Standard lead acid, deep cycle batteries last, on average, for around 5 – 7 years. So these will need to be replaced at some point. Despite their limitations, I feel that there is some merit to portable solar generators. If you use them where there is enough sunlight, of course. You can get a small 400W solar generator with a 50W panel for about $570. For a larger solar inverter (1400-1500W running power and 3000 -35000W starting power), you can expect to pay over $1000 excluding solar panels.